Hawaii on a Budget – Can It Be Done? Hawaii is a dream destination—a paradise. As such, traveling there is often seen as a once-in-a-lifetime event that will take several months or even years to save up for. For some people, it can seem totally out of reach. I’m here to tell you that traveling to Hawaii on a budget can be done, and done extremely well. Of course, everyone’s idea of a budget is different, but I’m going to define it in terms of flying to Hawaii at a discount, staying cheap, eating even cheaper, and doing things for free or for little cost. Luckily, if you’ve decided to travel to Hawaii, you’ve chosen a tourist destination that is abundant with natural wonders, which are Mother Nature’s generous gifts to residents and visitors alike. Sure, there are plenty of things to do and see in Hawaii that will require you to pay admission fees or buy a ticket. There are upscale restaurants and high-end hotels in Hawaii, just like in most every other place on the planet. However, the great thing about Hawaii is that it’s filled with some of the most amazing cheap or free sights and attractions, which are just a natural part of the incredible landscape of this tropical paradise. 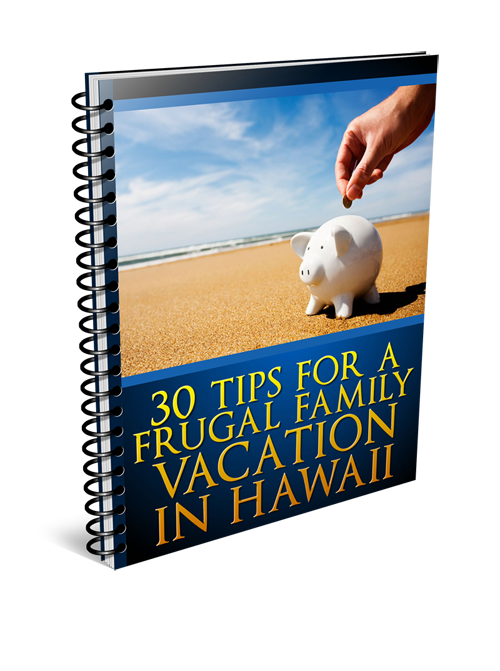 Let’s take a look at each aspect of a budget Hawaiian vacation in detail and talk about ways to save money on each one. 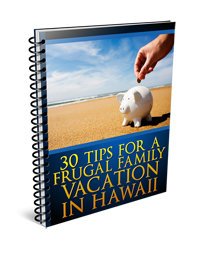 It’s a given that you’re going to have to fly to Hawaii, so you’ll need to find a way to save money on your plane ticket. No matter where you’re traveling to, you can find deals in two ways—book early or look for last-minute deals on flights that need to be filled. If you’re flexible with travel dates, you may be able to score a discounted plane ticket for traveling mid-week or taking red-eye flights. There are plenty of ways you can sign up for airfare alerts online, which will let you know when special fares are available or when rates drop dramatically. Simply enter your desired city into the search criteria, and wait for email messages to appear in your inbox. These may ask you to purchase tickets that same day for deep savings. Often, if you are willing to fly out of a secondary airport in your city, you will find the best deals on flights to Hawaii. It’s also in your best interest to sign up for several airlines’ frequent flyer programs, which are usually free and will help you to save money over the course of several flights. You may even qualify for free meals or upgrades. Depending on what you want to do and what you have in mind for your Hawaiian vacation, you may find that one island is more economical for you than others. In general, Oahu and The Big Island tend to be cheaper, considering factors like food, accommodations, attractions, and transportation. Lanai and Molokai, the smaller islands, are more expensive to travel to because of their remoteness. Maui and Kauai fall somewhere in between. Of course, each island has incredible beaches and lots of green places to roam. If you can find a great deal on airfare, consider spending your vacation taking in only free activities and attractions like touring the island on foot and viewing nature’s beauty. Deciding where you want to stay in Hawaii will take some research and planning if you want to keep to a budget. Two great options for accommodations in Hawaii are home exchanges and vacation rentals, which are usually quite a bit cheaper than staying in traditional hotels, and often even free. Home exchanges work by allowing travelers to free up their home for visitors coming to their city to stay in, and in return they can stay in someone else’s home in Hawaii for no charge. It’s simply a home swap that two parties agree to, which results in free accommodations for as long as agreed upon. This can be a wonderful travel resource. Choosing vacation rentals in Hawaii works pretty much the same way as booking a traditional hotel, but your choice of accommodations will include high-rise apartments or condos, private residences, cottages, villas, estates, and even town homes. Vacation rentals are often cheaper than hotels because the property owners simply want to make a little money off a vacant property, and will sometimes charge minimal fees just to cover their costs. When you stay in a vacation rental, you usually have access to cool features like full kitchens, spacious living rooms, multiple bedrooms, fireplaces, yards, pools and more. If you’re looking for a traditional hotel, try to find a discount rate by joining a travel or automobile club, or ask hotels for any special packages they may offer. You will find the best deals for a budget vacation if you are willing to stay at 2- and 3-star properties, which are plentiful on Oahu. As with airfare, try to be flexible with your dates and you’ll have a better chance of scoring a great deal. You can absolutely eat on a budget in Hawaii by avoiding restaurants in major tourist districts and in big hotels. Instead of dining in popular areas like Kaanapali on Maui, Poipu on Kauai, or Waikiki on Oahu, ask locals for their favorite hidden gems and off-the-beaten-path locations for great food and drink. Sometimes you’ll find delightful roadside stands selling fresh fruit and vegetables. There are also many farmers’ markets in Hawaii that offer terrific selections of unique seasonal produce and goodies. You’ll be able to pick up some tasty pineapples, mangos, coconuts, and other local treats, and many of these farmers have small cafés and eating areas where you can sit and dine. So, you got to Hawaii for a great price, found a cheap place to stay, and are eating inexpensive local fare. What do you do in Hawaii on a budget? The first thing you do is make your way to a beach. You’ll be able to find great beaches on every island, and this is one of the best ways to engage in budget-friendly fun on your Hawaiian vacation. Spend an hour or the entire day sunning, swimming, surfing, snorkeling and eating all of that cheap produce you bought earlier in the day. A couple of the best beaches in Hawaii that you can visit for free include Black Rock on Maui and Punalu’u Beach Park on The Big Island. You won’t have to part with any of your vacation dollars to see stunning sand in shades of red, black, green, gold and white. You may also see some beautiful ocean creatures breeching off of the Hawaiian coastline. Don’t forget to check out free museums and attractions like the USS Arizona Memorial at Pearl Harbor, on Oahu. This amazing sight costs nothing to view, but to assure yourself a ticket you’ll have to arrive early, at about 7:30 a.m. In short, with just a little bit of planning, you can have the Hawaiian vacation of your dreams without losing your shirt. 7th May 2014 10:00 am Simon Comments Off on Hawaii on a Budget – Can It Be Done?